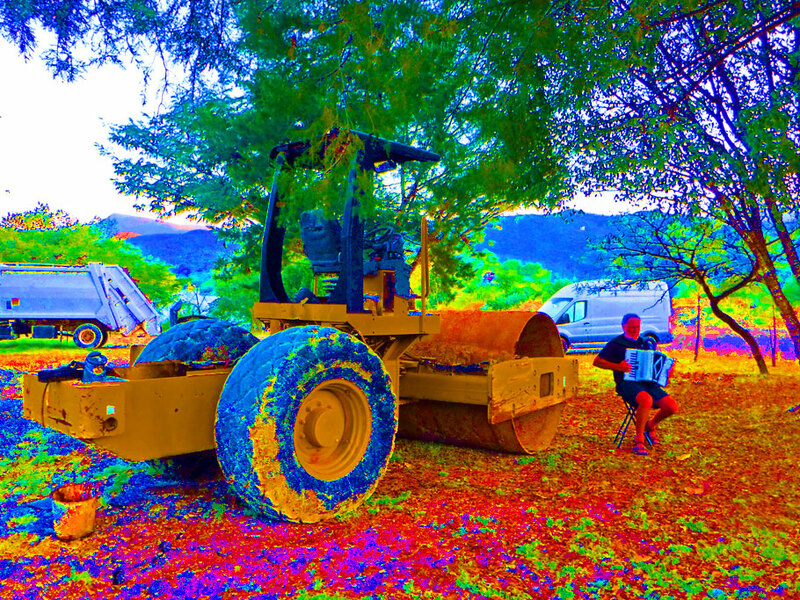 2 – Things in this picture you don’t usually find in a campground (besides an accordion)? A garbage truck and a pavement roller. The end of November 2018 through 10 days in March 2019. 440 – Largest gathering of people dressed as cats. No really – this happened at the ASEAN Film Festival and Awards 2017 (Malaysia), in Kuching, Malaysia, on 4 May 2017. This beats our record when Greg dressed as a crazy cat lady for Halloween and 4 of us dressed up as his cats. 141.3 – Miles per hour – the fastest speed achieved by a motorhome. Simon Robins achieved this world record driving his Fiat Doblo motorhome in East Yorkshire, UK, on 21 October 2014. Not sure why anyone would ever need to go that fast in an RV. 50 – The number of languages that Miguel de Cervantes’ novel Don Quixote has been translated into. 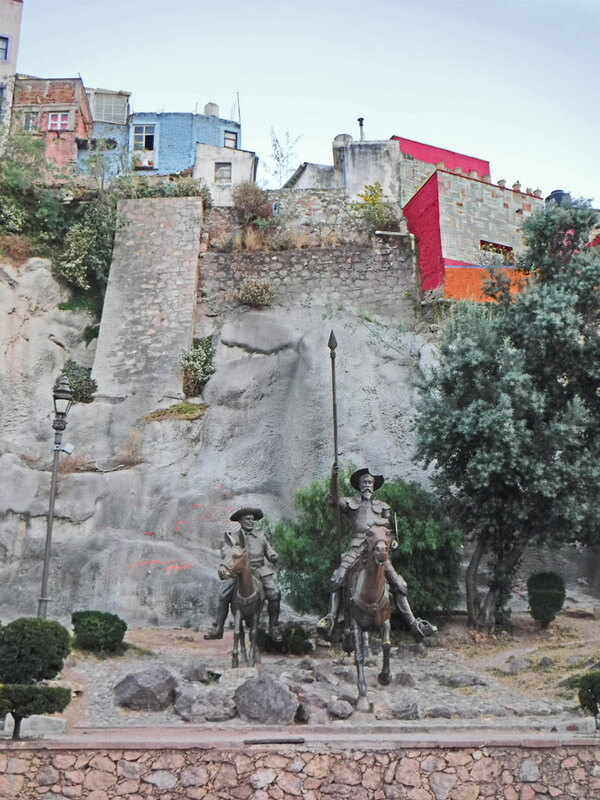 Don Quixote and Sancho Panza statues in Guanajuato. Even though Cervantes (the author of the book Don Quixote) doesn’t really seem to have a connection to Mexico (as far as I know), they love him in Guanajuato and other parts of Mexico. 4 – How many times we got stuck after deciding to abandon our plan to go to the Lava Church. We had kinda forgotten about the Lava Church – The only remaining structure from the village of San Juan Parangaricutiro after the Paricutin volcano started erupting in 1943. It took almost a year for the lava to reach the church 2 miles away. Today the church is half embedded in the rock. 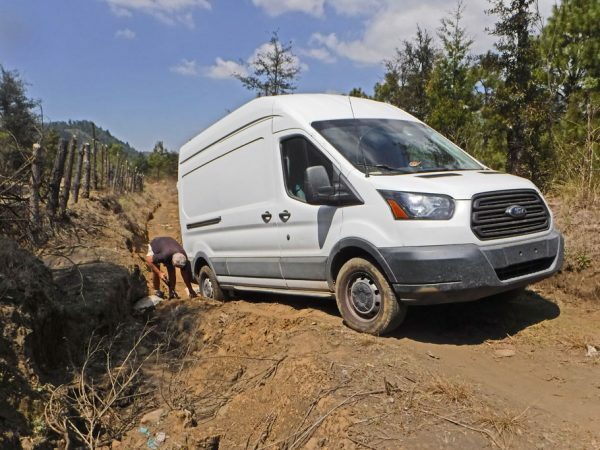 As we drove out the unpaved road to the church we quickly decided that the road was no good for us. 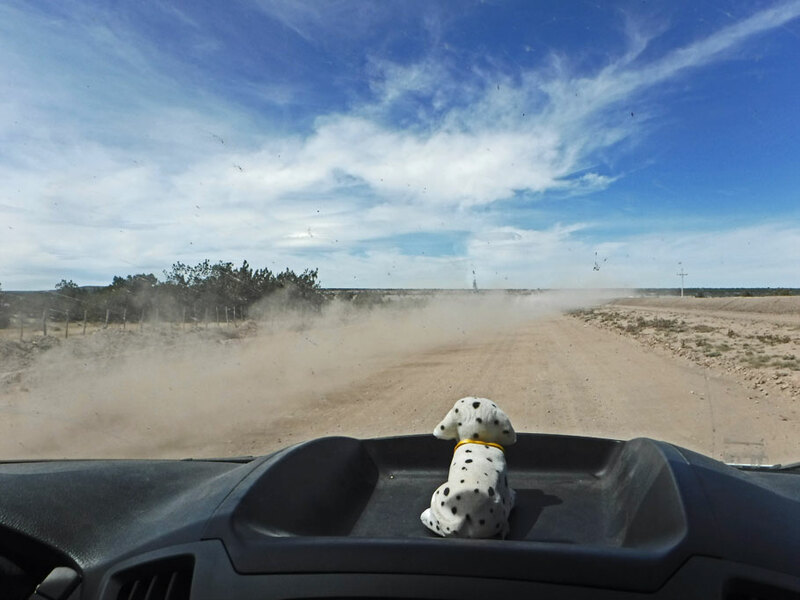 We drove a bit more down the narrow rutted road before we could find a place to turn around. On our return back to the highway it became obvious that we had made the right decision after we got stuck 4 times, fearing the van would tip or slide off into a deep ditch. After our aborted trip to the Lava Church, Greg uses boards to get Ballena Blanca unstuck before she slid down into the ditch. 5954 – Miles traveled in Mexico. Ok – this is sort of a guess. Greg says it was just under 6000 miles. 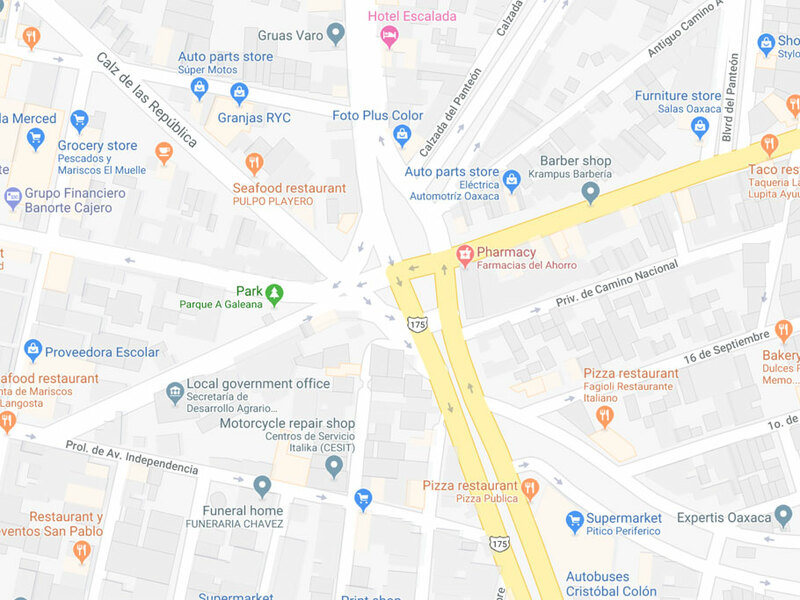 42 – How many different places we camped in Mexico. 17 – Mexican states visited – Sonora, Sinaloa, Nayarit, Jalisco, Michoacán, Mexico, Cuidad de Mexico, Morelos, Puebla, Oaxaca, Guerrero, Guanajuato, Querétaro, San Luis Potosí, Zacatecas, Durango, and Chihuahua! This is over half of the Mexican states. If you include the previous states in Mexico we have visited on other trips the total comes up to 20 – almost two-thirds of all the Mexican states! 1– How many gifts I was given in Mexico City. So Greg, Wayne, and I were wandering around in Bosque de Chapultepec in Mexico City when a young boy stopped me and asked if I spoke English. He was looking for someone to help his little sister with a school assignment to practice speaking English. I suppose being a Gringo and not being a big scary man (Wayne or Greg), it was a safe bet that I could help. The boy introduced me to his mother and little sister then asked if he could videotape while his sister asked me questions in English after which I would ask her a few questions in English. They were a very lovely family and the little sister spoke English very well! As a thank you for my help I was asked me if I drink tequila. Remembering our recent tequila binge on New Year’s Eve, I said, “yes … sometimes” and was given a shot glass with a picture of the Aztec sun stone. 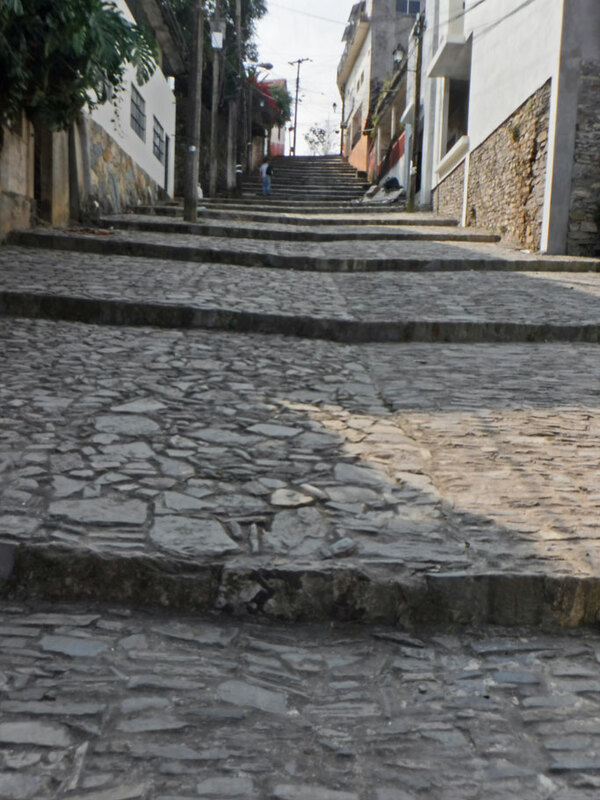 4 – how many times I was offered a seat on the Subway in Mexico City. Usually, we stood on the subway – especially when we weren’t going too far, but also because most of the people riding the subway weren’t tourists like us and were most likely starting or ending a long day at school or work and it seemed like they needed to sit way more than we did. But Mexican men can be very kind and chivalrous. 9 – How many days we spent sick in Guanajuato. Greg got a cold and then three days later I got the cold. Luckily we were in a very nice hotel RV park with a beautiful clean hot shower, a place to do laundry, a swimming pool, a fantastic view, and a very nice host and staff. When we left the hotel manager told us that we had the record for length of stay in the RV park. 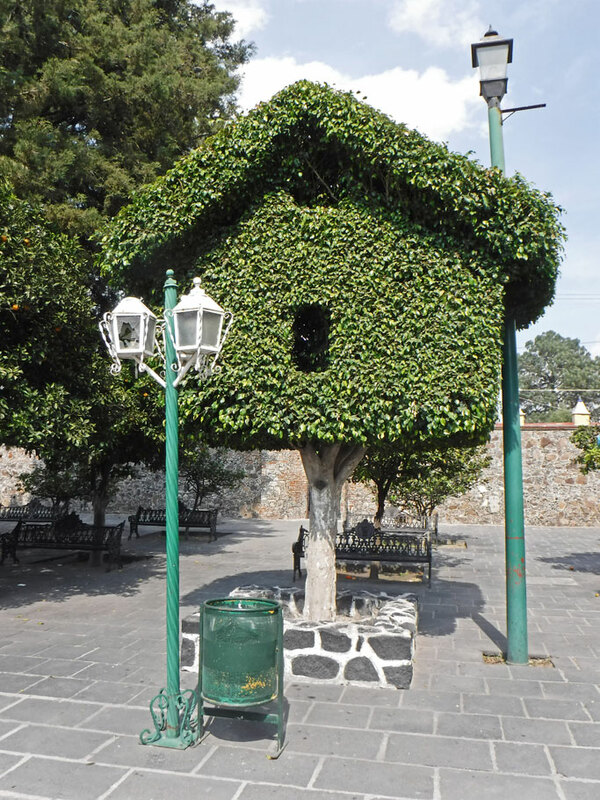 Our home for 9 days in Guanajuato while we were sick. We had the site mostly to ourselves. Three guys from Russia came in a van a spent one night and we shared the spot for a couple of days with this grey van from Switzerland. 7 – Number of police interactions we had in Mexico. 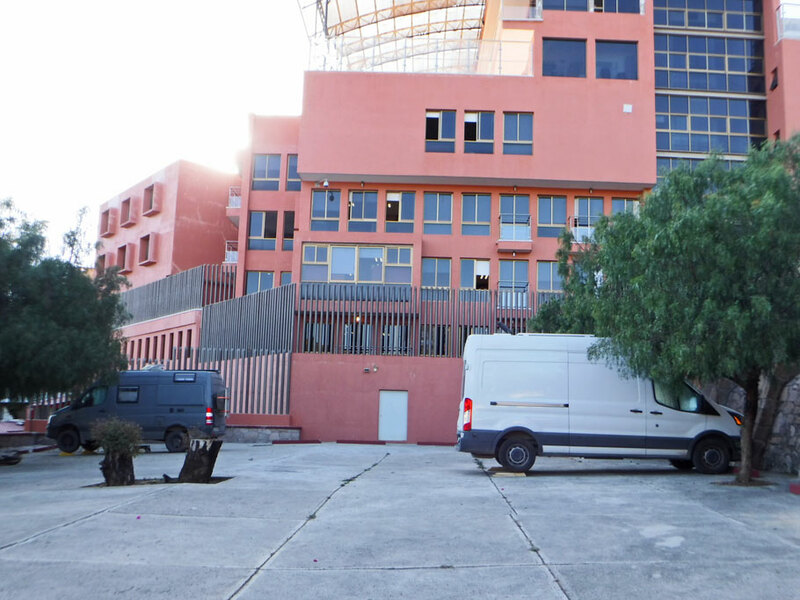 1 – shakedown for a “donation” – we didn’t pay, 2 – traffic stops (no ticket issued), 1 – nice chat with a tourist police officer, 3 – knocks on the van. 7 – Number of different countries we met people traveling from – Canada, the US, Belgium, Germany, Switzerland, Argentina, and Russia. – A donkey sliding off a steep hill on to the road. – Ok, this didn’t happen to us, but our friend Yolanda said that it happened to her and her husband once. – Road work – especially when they tear up the entire highway and make everyone drive in the dirt next to where the road used to be. – Roundabouts. Roundabouts are crazy in big Mexican cities – sometimes with as many a 7 or 8 arms. Almost invariably we would exit them at the wrong place. 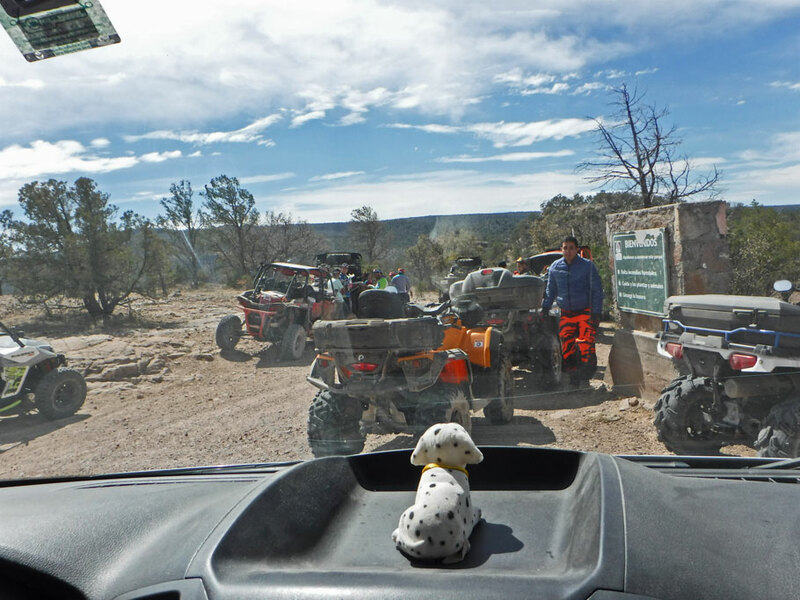 Four wheelers moving out of our way as we left Cumbres de Majalca. Driving along side of where the highway used to be. Every vehicle that passed us left a trailing cloud of dust. This was a particularly challenging roundabout in Oaxaca City. 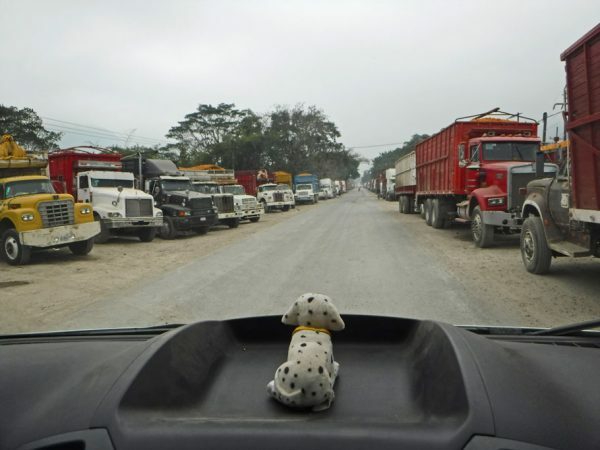 We had heard about the orange trucks and thought that they would slow us down – but they were all nicely parked alongside the road – hundreds and hundreds of them waiting to get into the processing plant. 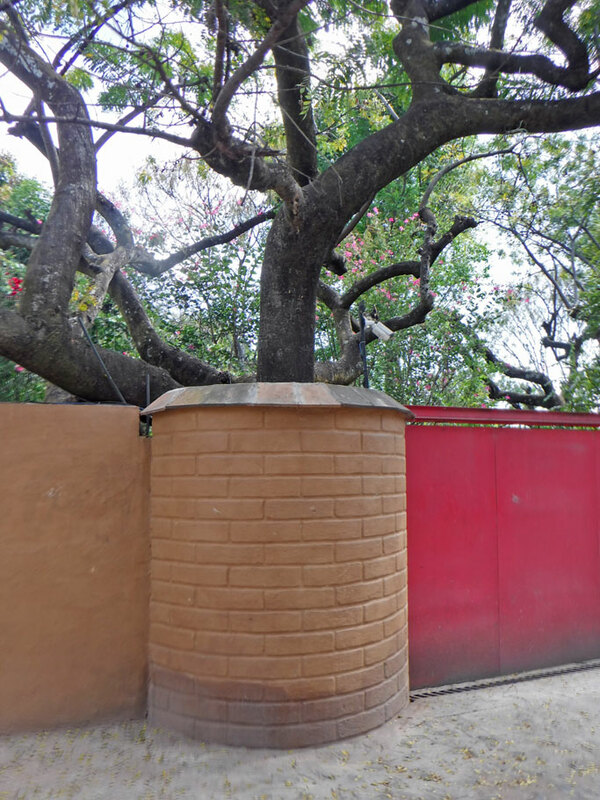 – Sometimes Google maps will send you down a road that is really a staircase. Google maps thinks this is a road. Campground at a Ecotourism site with zipliner going over the van. – So many pet Schnauzers. – Everyone is so cold. Even pets wear sweaters in 70-degree weather. 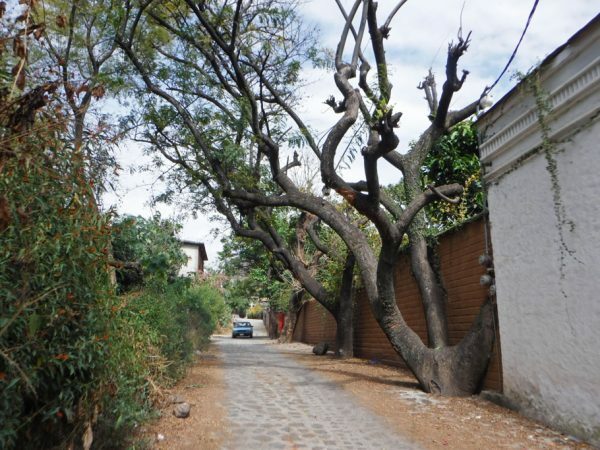 – When building walls or roads, trees are either left in place on the road or worked around. – Although there are many signs on the highways instructing people to obey the signs – no one does. Everyone seems to make up their own traffic rules but it works because everyone also cooperates with everyone else on the road. 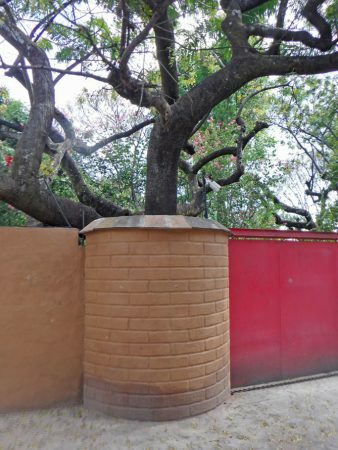 Wall built around a tree. 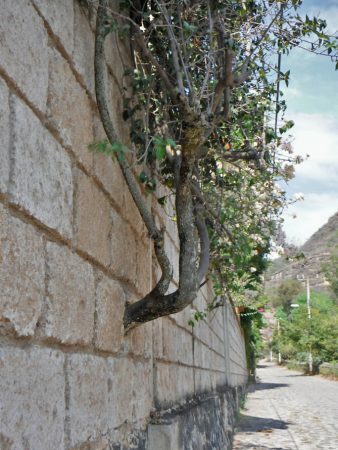 You would have thought they’s just lop that limb off when they build this wall. 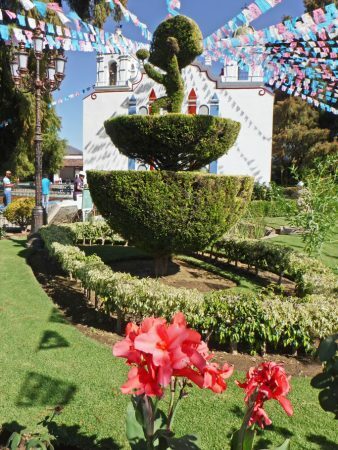 Topiary at Church of Santa María Tonantzintla in Cholula. 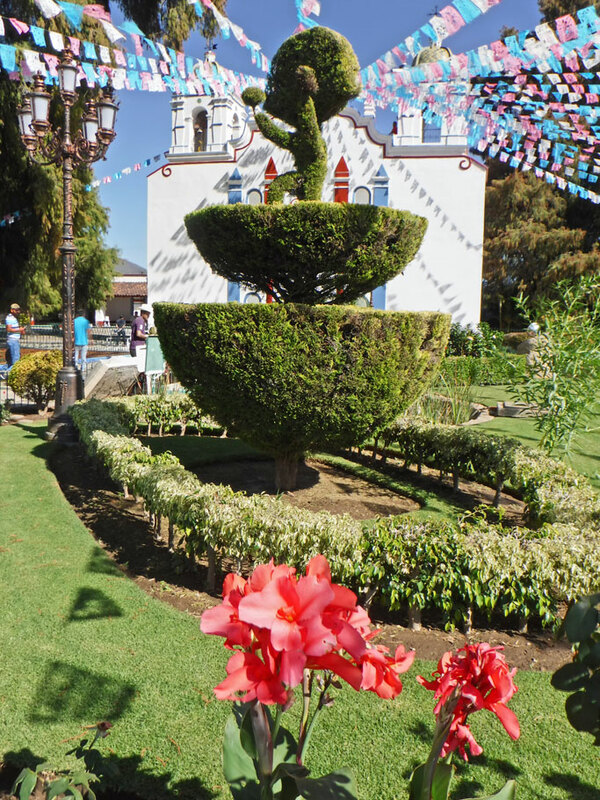 Topiary at Templo Santa María de la Asunción in Tule, Oaxaca. 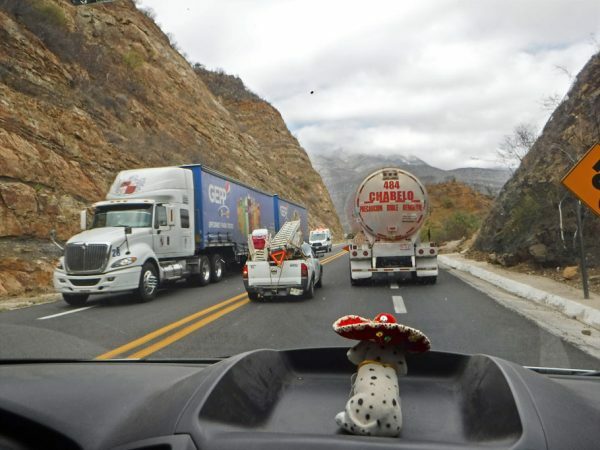 Typical Mexican superhighway. It’s two lanes, each having a large apron. Slower vehicles are supposed to lean right to allow easier passing. So basically it’s a three lane road where opposing traffic “plays chicken” in an imaginary center lane. Single solid yellow line means “No Passing”. Double solid yellow means “I Mean It – No Passing”. No one obeys the lines. I don’t know. We spent 3 1/2 months driving through lots of small towns, through lots of countrysides, and through many big cities and never had a problem. We were usually the only Gringos wherever we went. We have heard stories of scary crimes – but I can also tell you stories of scary crimes in Atlanta or almost any other place I have lived. In fact, apparently my home town, St. Louis, was named the most dangerous city in the US last year – and I wouldn’t hesitate to go there. There are so many more things that I could say about Mexico but really we have been out of Mexico for three weeks now and the blog needs to return to the US too. 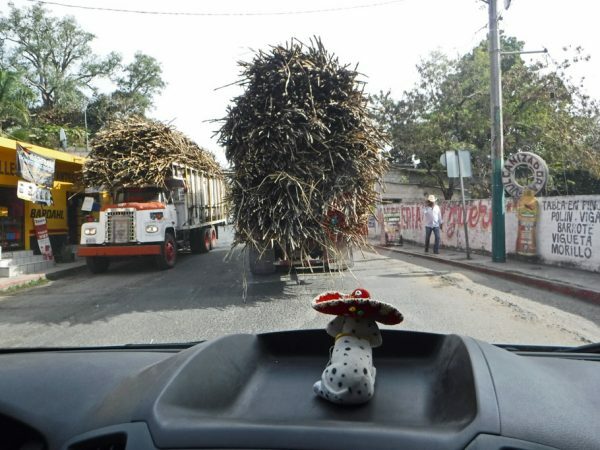 We have only one more to go (I promise) — The Cost of Being a Nomad in Mexico. Look for it later this week. See below a map of all the places we went and camped with links to all our blog posts! Adios y que le vaya bien! This entry was posted in Mexico, Nomading, Nomading Numbers, Travel On The Dirt and tagged Mexico, Nomad, Overlanding, Overlanding Mexico, Traveling. Bookmark the permalink. Muy bien mis amigos. You’re from old St. Lou, like my hero Chuck Berry! Thanks Robert! Yep – born and raised in St. Louis! Some very funny facts and photos here! I have another one for your five things that slow you down more in Mexico than the US (you’ll have to make it six :-)): topes! I can’t believe you guys actually keep track of all the different kinds of camping places you stayed at, or the nationalities you met in Mexico. What an adventure! Google sent us on a 10-mile dirt/sand road to Navajo National Monument in Arizona yesterday. It was easily the most stressful drive in Zesty, but luckily, we didn’t get stuck. Greg seems like a pro to get out of a situation like that! I mentioned topes in my last Numbers post so I didn’t mention it this one. 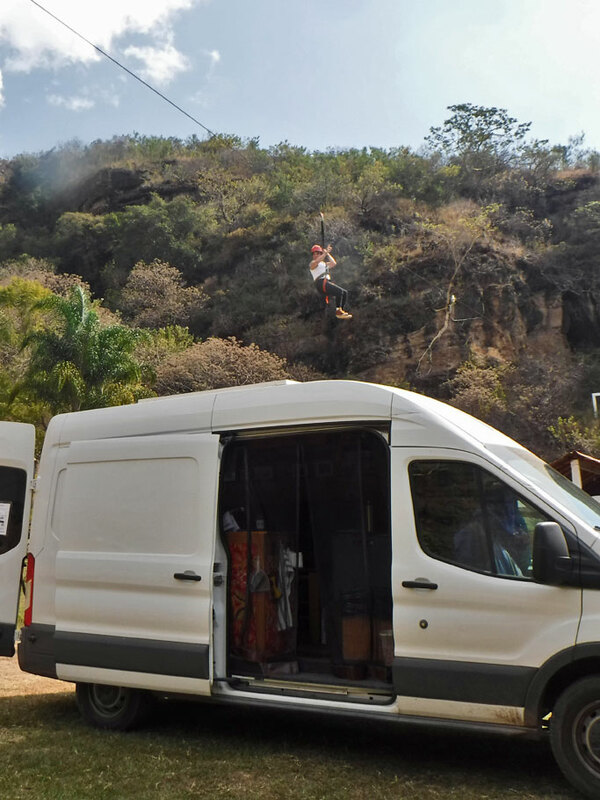 Topes are definitely the number one thing that slowed us down in Mexico – which is their purpose, of course, and seems to be effective on most drivers (but not all). it wasn’t hard to keep track of all the nationalities of people we met since we really met very few other overlanders. I wish I had gotten a picture of the 3 Russian guys traveling the world in their van. The van had stickers with all the countries they had visited and other fun stuff on it. But they arrived late and were gone first thing in the morning – I guess if you are traveling the whole world you don’t dilly dally around a lot. I will have to find out about your drive to Navajo NM – I think we will be traveling there in a few weeks. I love having Google maps but after driving through Mexico we’ve learned to use its directions with a bit of caution.